Today, May 29, 2009, I again tried to make this interface. The radio I use is a Yaesu FT-847 and the audio connector I want to use is the DATA IN / OUT. Until now, the signal I eventually got in through the line in of the computer was low and full with all kind of interfering pulses. Now finally, a number of times later, I resolved the problem. The new transformer that I use has a higher internal resistance 100Ω instead of the 4Ω with the first one, and I also connected in the outgoing and the incoming circuit a capacitor. 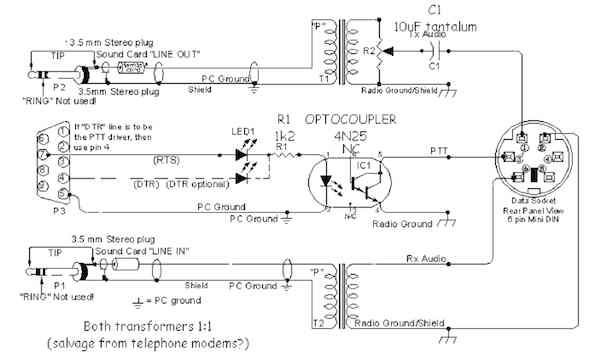 In the Ham Radio DeLuxe interface quide I found a universal schema for connecting a transceiver to a computer RS-232, Audio Line IN and Audio Line OUT. The interface isolates the transceiver from the computer using transformers and optocoupler. This example used a 6 pin mini DIN, but you can use every connector you want as long as it meets the requirements. Read the interface guide for more details.